A high-quality doubled-braced drum throne featuring stepless adjustment from 500-700mm adjustable via a spin up/down system. 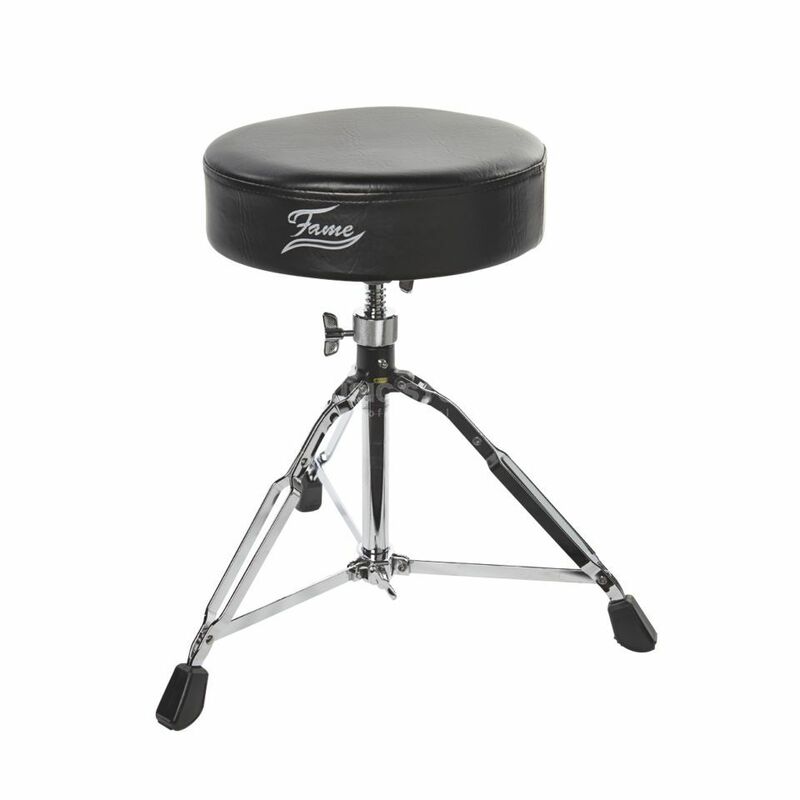 Chair drummer Fame D9000 has three double legs that make it resistant even on uneven ground. Soles of the feet are made of very hard plastic and will not break, even under heavy load. Fame D9000 chair seat made of soft foam, which provides a comfortable fit. 13 inches (33 cm) in diameter and 3.54 inches (9 cm) in height chair covered with a durable vinyl, which if necessary can be quickly wiped with a damp cloth. The seat is mounted on a screw shaft. Thus, FAME D9000 chair can readily be adjusted in height by the seat rotation or counterclockwise. The lowest position of the chair - 19.68-inch (50 cm) and the highest - 27.56 inches (70 cm). height fixation is achieved thanks to a special screw. Quality chrome plating of all parts of the chair provides the final "touch to the portrait." Also, a chromium layer protects drummer chair from external influences, such as moisture and rust. This Throne is very confortable and stable. Works perfectly, and adjust just right. Easy to use and pack for a gig. Comfortable, easy picking for who wants a low price throne. Was part of a bundle, so its not my main throne, since I already had a better one. Very nice throne for its price. It came as part of a bundle. It is steady and easy to adjust. After sitting on it for some time (1-2 hours per day for 3 weeks) I do not feel any back stress of any kind, it is comfortable and very decent. This throne is very very nice adjustable, strong, stable, and cheap too! Is very comfortable.... after hours of playing Im not tired at all. Its a very nice adjustable drum stool, very strong, stable, cheap and pretty!